I’ve fallen a bit behind… Fellow bloggers Fay Moore of her inspiring Fay Moore: I Want to Be a Writer and Stacy Lyn of her engaging Stacy Allbritton: Web-Footed Louisiana Scribbler, um, Scrivener have nominated me for the Versatile Blogger Award. 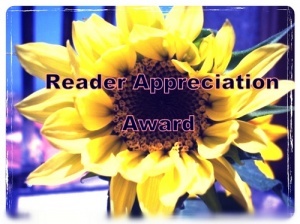 And Terri of the beautiful Daily Sweet Peas has kindly passed along the Readership Appreciation Award. I’ve been witness to this project circulating WordPress (being relatively new to the blogging arena), and it’s such a wonderful tool to connect with other bloggers and their work. I honestly had no idea such warm, kind kindred spirits existed in this community, and for that I’m pleasantly surprised and ever thankful. Profuse thanks for your nominations and votes of confidence, Fay, Stacy, and Terri! I was raised on a 3-mile-long island, the rim of a sunken volcano in the middle of the South Pacific — an atoll in Micronesia — 6 hours by plane from Hawaii, 6 hours by plane from Australia. Think Amelia Earhart’s lost flight. Having moved stateside at college-age, and lacking the impact of mass media at those impressionable ages, I still find myself catching up on key pieces of Americana. I’ve been a vegetarian since birth… Raised by carnivores with favorite meals including steak tartare and sushi caught from the surrounding ocean. Blech. I’ve never been married; while this fails to shock me or the strong females in my family, it remains an awe-inspiring topic of discussion. Having always been surrounded by a menagerie of rescued critters — cats and dogs and ferrets and horses, oh my — they remain an integral part of my life. I dance and sing horribly off-key on a regular basis — any event can prompt this behavior, including the making of ice, cooking noodles, rain, getting dressed…. The list is endless. ← Growing Gator Baby — A Survivor! Thank you! And I look forward to checking out the other blogs you listed! 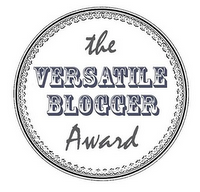 Fey, congratulations on your nomination for the Versatile Blogger and the Readership Appreciation Awards. There are many sites that I like to follow, but few that I admire as much as yours. It is because you care so much about the earth and the creatures on it; your words and photographs show not just interest in what you are communicating, but deep respect and commitment to protecting your subjects. To me, these elevate what you are doing here above the levels of interest and enjoyment to a higher purpose. Thank you, Fey, for expressing you appreciation of my own blog by paying these nominations forward to me. It is a bit humbling to think that what I say and do on it resonates so deeply in you and others. Many, many thanks! P.S. : So you admire KH? That speaks volumes – now I am really beginning to know you! 🙂 She was something else, wasn’t she? And thanks for links to other great blogs. Thanks very much! So exceptionally kind of anyone to even consider this little project. 🙂 I hope you enjoy the other links! CONGRATULATIONS ON YOUR NOMINATION – YOU DESERVE IT!!! Thank you for sharing about ownself. I can relate to the marriage question – my standard answer was “2 years from today”. Now no one to ask the question and 2 years long past! such is such and just as well!! Congratulations. It is our joy to share your posts everyday. Beautiful words that inspires. I enjoyed reading The seven things about yourself. Full of life and excitement….Thanks.